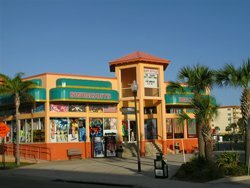 Johns Pass Village is the main shopping area between Madeira Beach FL and Treasure Island FL. Located at the geographical separation between Madeira Beach and Treasure Island, it is a focal point on the beach for shopping and dining. The Village is an amazing conglomeration of high-energy bars, souvenir shops, waterfront dining, SeaDoo rentals, parasailing, fishing charters, and boat tours. Hundreds of thousands of people visit Johns Pass Village during their Florida beaches vcation. It is crowded most of the year, with Spring Break straining the limits of this small area. T-shirts, large towels and beach wear are in tremendous demand by those who visit the beautiful Florida beaches on the barrier islands. Souvenirs and gift items are colorful, unique and reasonably priced. The Village has an overwhelming amount of shops. It is like an outdoor mall on steroids. Many visitors spend some time here each day on their Florida beaches vacation. The problem will not be in finding what you want to buy, it will be in narrowing down the choices and remembering the shop where you saw the item. There is not a lot of clarity on exactly how the Pass acquired its name. There's a variety of speculation since accurate records have not been uncovered, but the common denominator in all of them is a gentleman by the name of John LeVeque. Some accounts suggest he was pirate, yet there is no record of him ever harming nor holding a hostage for ransom. Other theorists suggest he was just a humble landowner trying to make a go at Life as a fisherman. Wherever the truth lies, we know that during the bad hurricane of September 27, 1848 John LeVeque was looking for safe harbor while sailing north in the Gulf of Mexico toward home...what is now Madeira Beach In the morning following the storm, he found that his home island had been cut in two and he discovered a new way into Boca Ciega Bay. John LeVeque made the first passage through the new inlet, hence the name of the Pass. Johns Pass connects the Gulf of Mexico with the Gulf Intercoastal Waterway. 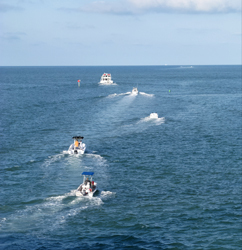 Everyday, hundreds of private boats, fishing charters, commercial gouper boats, and even casino boats travel through the Pass. Visitors can find just about any type of excursion they want. Charter fishing vessels and tour boats come and go, so it is best to call several to get an idea of the rates. Do not be surprised if you receive a "This number has been disconnected" message. You may want to go down to the Village and talk with some of the store tenants to find out their recommendations. 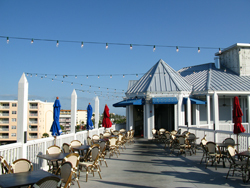 There are some very nice restaurants at Johns Pass Village, some with great views of either the harbor or the Gulf. 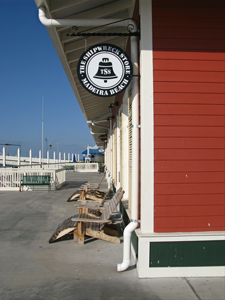 As you can see from this shot of the Bubba Gump Shrimp Company , they are colorful and energized to enhance your visit. There are close to 15 different places to eat in the Village. However, not all are on the top level and not all provide a view of the waterfront. Seafood is going to be the main dish here, but there is also the choice of wraps, pizza, and burgers. 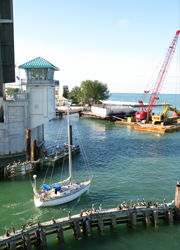 For the past couple of years, Johns Pass has been snarled with construction of a new drawbridge from Maderia Beach to Treasure Island . Although it is much needed, the traffic problems create a strain on the entire area. Plus, many visitors complain of the enormous amount of dirty barges, huge cranes, giant rusty pipes and a lot of noise. 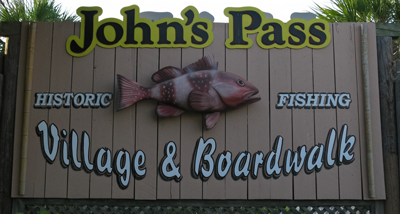 It has really hurt the businesses at Johns Pass Village and it may be until 2010-2011 before everything is completed. Hopefully, they will survive and eventually thrive once Gulf Blvd has a consistent flow. As you can imagine, when a sailboat comes through and the drawbridge is raised, traffic is backed up for close to a half-a-mile in Madeira Beach. Tempers of locals can get real short when visitors attempt some sort of backing maneuver to turn around. Visitors also feel cheated when they dine outside on a beautiful Florida evening and only have a view of oily, rusted pieces of huge construction machines. It is a sad and fragile situation for businesses in the Village to endure. 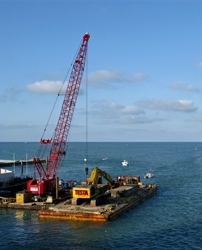 Don't allow your Florida beaches vacation to be soured by negative focus on the construction. This too shall pass. The construction is today's reality, but it will not always be this way. Many of the older locals who live in the area enjoy coming up to the top level a little after sunrise and feeling the warmth of the sun on their faces during the late Fall and early Spring. Sitting on the wooden benches may not be the same as sitting on a Florida beach, but for some, the peacefulness of the harbor and the movement of the grouper boats heading out for fresh seafood is a nice start to the day. There is always a light breeze and the clean hint of salt water and coffee before the restaurants begin cooking. Johns Pass Village can also be a nice place to walk around before crowds start jamming the boardwalk and sidewalks. I am not one for crowds of people, but you do not have to endure fighting your way along the Village sidewalks in the afternoon to enjoy Johns Pass. Many find the fishing good near the jetty on the Madeira Beach side. Others come to view dolphins playing or to see an occasional shark. The Johns Pass Jetty is also a setting for Florida beach weddings, (although most couples prefer to go a few miles south to the Treasure Island Pavilion on Sunset Beach. Watching the drawbridge being raised can also be an experience. When you come to Johns Pass Village, make sure to bring plenty of Quarters. Parking meters are big business here and tickets are given by the handful. Do not try to park over here, then go across Gulf Blvd to the beach. The parking meters only last for a two hours, and it causes hardship on the merchants who already have to deal with the construction mess cutting into their business. There is public beach access parking right across the street. To me, it is much easier to spend a little time at the beach, go for a walk, go for a swim...then just cross the street to get something to eat or drink at the Village. 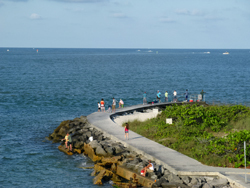 Johns Pass Village is a definite destination for many during their Florida beach vacation.